Longaniza (Spanish pronunciation: [loŋɡaˈniθa], or American Spanish: [loŋɡaˈnisa]) is a Spanish sausage (embutido) similar to a chorizo and also closely associated with the Portuguese linguiça. Its defining characteristics are interpreted differently from region to region. It is popular in the cuisines of several regions of Spain, Puerto Rico, Dominican Republic, El Salvador, Mexico, Chile, Argentina, and Uruguay. In the Philippines, it is called longganisa and differs greatly with hundreds of variants with different vernacular tastes and forms due to the 144 ethno-linguistic groups in the archipelago. In Spain, longaniza are long thin salchichón that differ from chorizo in that they substitute black pepper for paprika and may have different spices like nutmeg. In Argentina and Uruguay, longaniza is a very long, cured and dried pork sausage that gets its particular flavour from ground anise seeds. This results in a very particular aroma, and a mildly sweet flavour that contrasts with the strong salty taste of the stuffing. It is used mainly as an appetizer or in sandwiches, and very rarely cooked. In Chile, longaniza may be eaten during a barbecue with bread as a choripán. The city of Chillán is known for its longanizas. Chillán's football team Ñublense are nicknamed The Clockwork Longaniza (Spanish: La longaniza mecánica). During the festivities of the 18th of September, longaniza is prepared in great quantities. Mexican longaniza tends to be longer than Mexican chorizo and is spicier. Puerto Rican style longaniza is made of pork, but also is made with chicken or turkey. The red orange color is from the addition of annatto seeds. Rice with longaniza is a popular dish. Since colonial times, Dominican style longaniza has been prepared with the juice of bitter oranges (or lime), garlic, oregano and salt. For the casing, pork intestines are used. Then the longaniza is left to cure in the sun for some days. It is eaten fried in its own fats or in vegetable oil. Quality varies considerably because it is generally home-made. 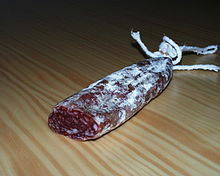 Best quality longaniza usually has a 70% lean fat content. Longaniza or longganisa (also called chorizo, choriso, tosriso, or soriso in Visayan regions) refers to sausages flavoured with indigenous spices. They are commonly dyed red, yellow, or orange with achuete seeds. Longganisa are usually fresh or smoked sausages, typically made with varying ratios of lean meat and fat, along with garlic, black pepper, salt (usually coarse sea salt), saltpeter, muscovado or brown sugar, and vinegar. Variants may add paprika, chili, anise liqueur, and other spices. Most longganisa are classified primarily by either being sweet (jamonado or hamonado; Philippine Spanish: longaniza jamonada) or garlicky (de recado or derecado; Philippine Spanish: longaniza de recado, "spice-mixed longganisa" or literally "longanissa laden with a set of spices"). Most longganisa are made with pork. Unlike the Spanish chorizo and longaniza, Filipino longganisa can also be made with chicken, beef, or even tuna. Commercial varieties are made into links, but homemade sausages may be simple patties (bulk sausages) without the casing, known in Philippine English as "skinless sausages". 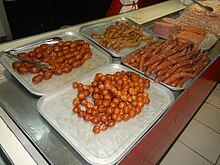 There are numerous kinds of sausages in the Philippines, usually unique to a specific region like Vigan longganisa, Alaminos longganisa, and Chorizo de Cebu. There are also a few dry sausages like Chorizo de Bilbao and Chorizo de Macao. The most widely known longganisa variant in Philippine cuisine is the Pampanga longganisa, because it is commercially mass-produced. ^ Marbella Guide. Chorizo, the quintessential Spanish sausage Archived 2006-03-10 at the Wayback Machine. ^ Grygus, Andrew. Sausages & the Like. Retrieved December 25, 2010. ^ a b c d e Edgie Polistico (2017). Philippine Food, Cooking, & Dining Dictionary. Anvil Publishing, Incorporated. ISBN 9786214200870. ^ a b Zeldes, Leah A. (2010-05-19). "Eat this! Longganisa, sweet Filipino sausage". Dining Chicago. Chicago's Restaurant & Entertainment Guide, Inc. Retrieved 2010-05-21. ^ "Different Tastes of Longganisa in Philippines". Go Philippines. Retrieved 25 March 2019. ^ a b Balido, Mark Jim. "Longganisa Around The Philippines: The Best of the Breakfast Staple". Philihappy. Retrieved Jan 5, 2017.